Review: Irish pub, sports bar with good rock music. 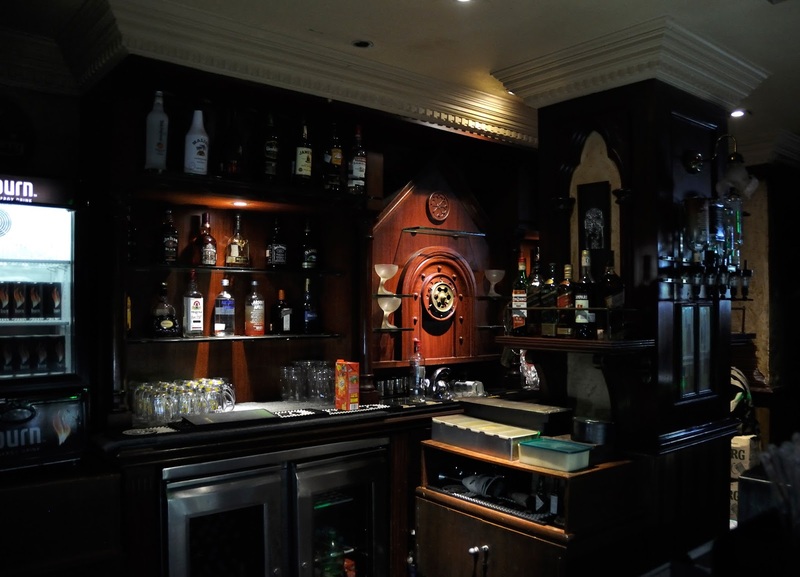 One early evening, we stumbled upon Irish pub located at Ramee Guestline hotel in Khar, Mumbai. Though it was just seven in the evening, we heard loud cheering sounds as we gingerly stepped inside. Every available space was occupied with sports fans cheering their favorite team. The pub had high bar stools placed in the centre and near a well lit bar. Big LCD screens played a Manchester United match which was intercepted with surprisingly good rock numbers at regular intervals. The warm wooden tones and framed pictures added to the old world charm feel of the pub. We were led to a separate enclosure, bereft of any screens which had well spaced tables. The pub also has an open air area strewn with rattan table and chairs. The bar menu boasts of domestic and imported Irish Beers, premium wines, cocktails, juices, mocktails, smoothies and more. We saw a lot of people having draught beer. Irish cocktails like Old fashion, Ink Street, White Lady, blue Hawaiian caught our attention. Roasted and juicy peanuts placed on every table made up for complimentary eats. The main course had an interesting choice of vegetarian and non vegetarian Italian, Chinese, Continental and limited North Indian cuisines. We ordered paprika potato wedges which were served with a garlic dip. Hot, crisp and oven roasted with paprika sprinkled over them, the wedges were a hit! Our next order, Sesame chicken salad had bits of grilled chicken along with bean sprouts, spring onions and fresh beans dressed in thousand islands and topped with roasted sesame seeds with a subtle hint of oregano. Flavorsome and aromatic, the salad was a winner. Char grilled pepper chicken; another starter had a dominant taste of black pepper and was served with a mint and pesto dip.For the main course we found more varieties in sizzlers, pasta, and pizza than the other dishes. We chose roasted lemon rosemary chicken and were pretty happy about our choice. Well roasted with a nice flavor of rosemary & lemon zest it was served with fresh baby corn, green and red peppers and long beans. The dessert aptly named long lasting vertigo was a sinful delight! Piled high, the chocolate cake was decadent and served with a scoop of vanilla ice cream. The cozy Irish pub has lot to offer and is not heavy on the pockets too. Every day of the week sees a special celebration where Mondays become most wanted night; Tuesday’s are romantic night with a candle lit dinner and on Wednesday enjoy karaoke nights. Irish pub delights the ladies on Thursday with princess nights with two free drinks to every lady. On Fridays DJ Dev rocks the house with Irish nights and on Saturdays DJ Terrance takes over with house and hip hop music. Enjoy Happy Hours from 12 in the afternoon till 7in the evening, which entitles you to buy one and get one free on chosen Irish cocktails, mocktails domestic wine, whiskey, vodka and beers. The English- styled pub serves hookah too. We experienced friendly and attentive service, specially the ever smiling manager, Pradyumna Panda bustling around and talking to regulars. Head here if you want to spend a relaxed evening with a large group of friends while sipping cold beer or to watch your favorite sports team battling it out. The bar gets crowded on days of sports events and cover charges to enter may apply. There are enough parking spaces in the vicinity and valet parking is available too.